Unyuunymous | Rozen Maiden TV Drama CD "Detektiv"
Otherwise known as the drama CD produced to accompany the first Rozen Maiden TV series, this CD was released on February 9, 2005. The first part of the CD contains an original episode-length story in several parts, including TV-size versions of the opening and ending theme songs, while the second part includes short soliloquies by each of the five dolls. I believe that it's probably intended to take place in between episodes 9 and 10 of the series, since all of the cast is present (including Souseiseki), while they don't seem to have entered the more serious final arc of the story yet. The CD does not contain any important spoilers for the TV series. A translated script is provided here in the usual format, as HTML with graphics, or as a single downloadable ASCII text file if you prefer. If you don't have the CD, I'm afraid you're on your own as far as obtaining a copy from an import store or somewhere on the internet, since the audio tracks themselves are not available on this site. 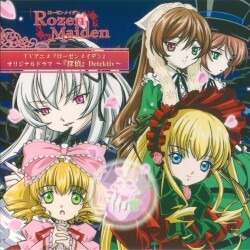 TV Anime Rozen Maiden Original Drama CD "Tantei - Detektiv"
Download a plain ASCII version (*.TXT) of the entire script here (30 KB).